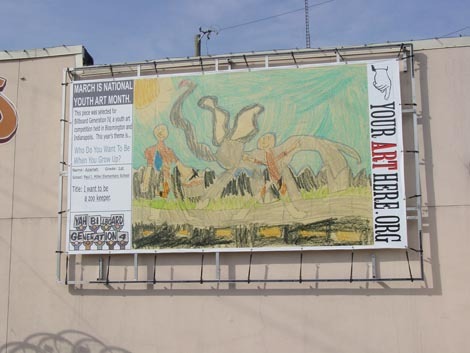 Your Art Here is a volunteer-run, non-profit public art organization. We need and are always looking for fresh insight and help from people like you. Volunteer activities range from mailings and mounting exhibits to helping with fundraising events and working with local kids during Youth Art Month…The list goes on. Help us out! Contact us to learn more. Aside from the casual volunteer, whom we depend on greatly, YAH often has specific needs that can be completed as a for-credit internship and practicum, or simply more substantial volunteer opportunities to enhance the resume and portfolio. YAH has successfully worked with students from Indiana University’s Arts Administration program, Fine Arts and the School of Library and Information Science, and we are always looking for ways to tap into other volunteer/internship networks. If you are interested in any of these, please contact us and reference the volunteer opportunity of interest. Engage in outreach with local K-12 teachers, home school organizations and partnering organizations such as Rhino’s, Monroe County Public Library, Waldron, etc.